The main difference between beans and legumes is that the beans are a type of edible seeds of the genus Phaseolus whereas legumes are the seeds produced inside pods. Furthermore, beans are a type of legumes that belong to the Fabaceae family. 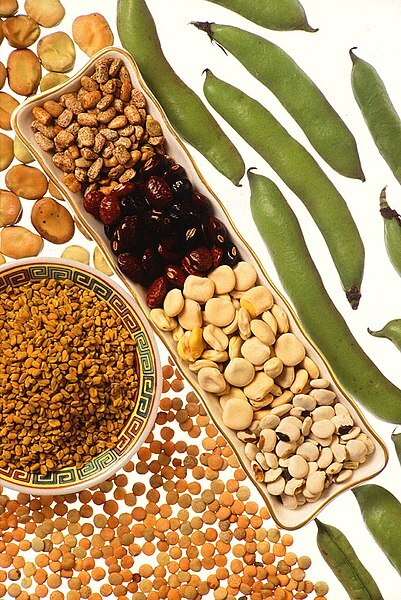 Moreover, other types of legumes include alfalfa, chickpeas, peas, lentils, peanuts, etc. Beans and legumes are two types of seeds belonging to the leguminous family. They are a great source of vegetarian protein and a better replacement for meat. Also, they are rich in fiber and B vitamins. Beans are the kidney-shaped seeds of the plants that belong to the genus Phaseolus. They grow inside pods. Therefore, they are a type of legumes. Generally, beans are a type of summer crop, which requires a warm temperature to grow. From planting, it takes 55-60 days for harvesting. The bean pod becomes yellow in color with maturation while the seeds inside it change their color from green to their mature color. Furthermore, the most common types of beans are black beans, black-eyed peas, cannellini beans, kidney beans, lima beans, pinto beans, navy beans, green beans, etc. Moreover, beans are rich in complex carbohydrates, proteins, folate, iron, and soluble fibers. Legumes are a type of vegetable including beans, peas, lentils, chickpeas, alfalfa, peanut, soybeans, etc. They are the seeds of the leguminous plants. There are two significant features in these leguminous plants: the growth of seeds inside pods and the formation of root nodes, which facilitate the growth of nitrogen-fixing bacteria. Therefore, legumes reduce the requirement of nitrogen-containing fertilizers for the annual crops in the field. Moreover, legumes are one of the most versatile and nutritive foods available. Typically, they contain a low amount of fat and contain no cholesterol. However, legumes are rich in proteins and carbohydrates. Therefore, they are a healthy substitute for meat, which contains more fat and cholesterol. Also, they contain both soluble and insoluble fiber. Beans and legumes are two types of seeds produced inside pods. They have root nodes inside which nitrogen-fixing bacteria grow. Also, they belong to the Fabaceae family. Furthermore, both are rich in protein, fiber, and vitamin B. Thus, human and animals use them as food. Beans refer to an edible seed, typically kidney-shaped, growing in long pods on certain leguminous plants while legumes refer to the fruit or seed of leguminous plants (as peas or beans) used for food. Thus, this is the main difference between beans and legumes. While beans belong to the genus Phaseolus, legumes belong to the Fabaceae family. Beans are a type of legumes while other types of legumes are alfalfa, clover, peas, chickpeas, lentils, mesquite, carob, soybeans, peanuts, and tamarind. 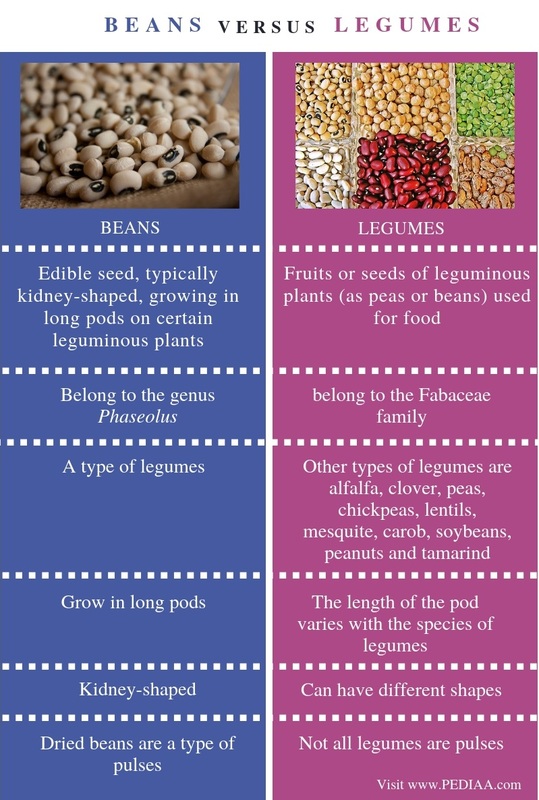 Also, another difference between beans and legumes is that beans grow in long pods while the length of the pod varies with the species of legumes. Moreover, their shape is also an important difference between beans and legumes. Generally, beans are kidney-shaped while legumes have different shapes. Furthermore, dried beans are a type of pulses while not all legumes are pulses. 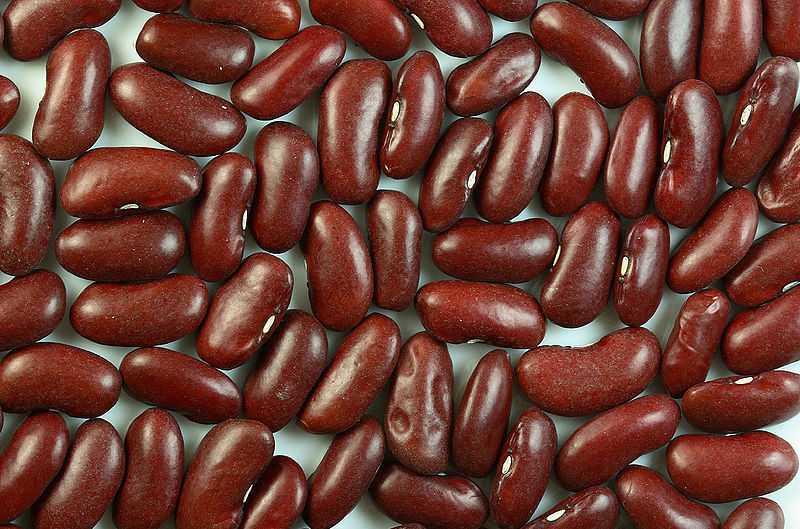 Beans are a type of legumes with specific kidney shape. Dried beans are used as pulses. In comparison, legumes are seeds grown in pods. Other types of beans are chickpeas, peas, lentils, alfalfa, etc. Both beans and legumes are rich in proteins, fiber, and vitamin B. However, the main difference between beans and legumes is their relationship. 1. Fletcher, Jenna. “6 Healthiest Beans: Benefits and Nutrients.” Medical News Today, MediLexicon International, Available Here. 2. Lee, Matthew. “List of Legume Foods.” Healthy Eating | SF Gate, 12 Dec. 2018, Available Here.